DUBAI, United Arab Emirates — Saudi Arabia's offer to send troops to fight the Islamic State group in Syria is as much about the kingdom's growing determination to flex its military might as it is about answering U.S. calls for more help from its allies in the Middle East. A Saudi deployment runs the potentially explosive risk of confrontation between one of the Arab world's most powerful militaries and forces keeping Syrian President Bashar Assad in power. That's if the Saudi proposal even gets translated into action. Just putting the offer on the table gives the Saudis an opportunity to show leadership in addressing U.S. concerns that its regional allies aren't doing enough to fight ISIS. It also puts pressure on Washington to do more as Defense Secretary Ash Carter and allied defense ministers gather in Brussels this week for talks on confronting the extremists. Brig. Gen. Ahmed Asiri, the Saudi military spokesman, made clear the kingdom's offer is contingent on the support of the U.S.-led coalition battling the militant group in Iraq and Syria. Saudi Arabia and the United Arab Emirates, which also has offered to deploy ground forces, are part of the coalition but have eased up on their contributions to the air campaign after earlier, high-profile sorties over Syria. They now are far more focused on another war even closer to home. In Yemen, a Saudi-led coalition heavily supported by the Emirates is battling Iranian-backed Shiite rebels and a former president's supporters who control the capital of Sanaa and other parts of the impoverished country. The Yemen intervention highlights Saudi Arabia's growing assertiveness since King Salman's ascension to the throne just over a year ago, along with the rise of his son, Prince Mohammed bin Salman. The 30-year-old prince was named by his father as defense minister and second-in-line to be king. Prince Mohammed has announced the creation of a Saudi-based Islamic military alliance intended to fight terrorism. The bloc includes much of the Sunni Arab world, several African and Asian countries, as well as NATO member Turkey. Not included are ISIS front lines Syria and Iraq, or Saudi Arabia's chief rival, Shiite powerhouse Iran. "The Salman doctrine is about projecting power and military strength," said Dubai-based geopolitical analyst Theodore Karasik, who believes the Saudis' offer for troops in Syria could portend other military expeditions in the region. "It may be looking for leverage, but it's also very serious." While the Saudis say their aim is to fight ISIS, the timing of the kingdom's announcement raises questions about its motives. Russia's intervention in Syria has sharply altered the military landscape, routing Saudi-backed rebels from key areas in the north and giving Assad the upper hand. Prospects for any meaningful peace talks appear to be dwindling by the day. Any ground troops deployed to fight ISIS would almost certainly have to enter from the Turkish border, close to the area where Syrian government troops and allied militiamen have been advancing under cover of blistering Russian airstrikes. 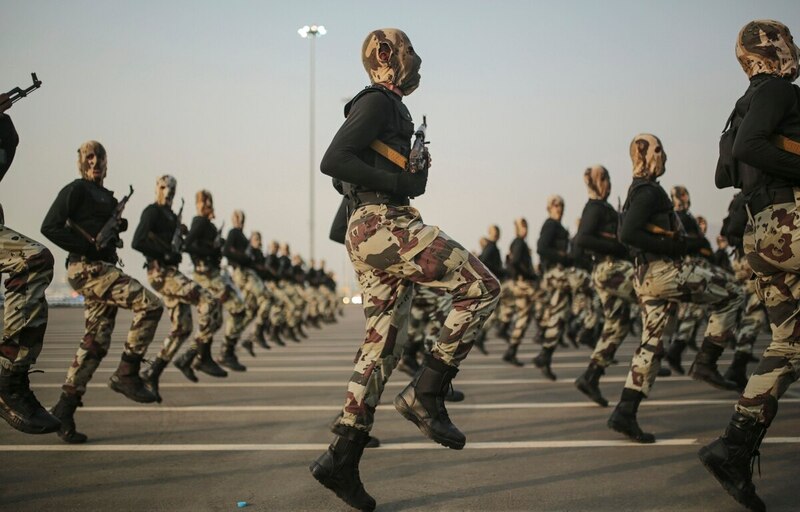 Saudi ground troops would find themselves embroiled in complex terrain where hundreds of Shiite fighters from Iran, Lebanon and Afghanistan also are fighting. That would make the proxy sectarian wars that Iran and Saudi Arabia have been waging suddenly more intimate, potentially putting Saudi and Iranian troops in the same fighting space. ISIS would certainly relish the chance to take on Saudi ground troops, given that it views the Saudi monarchy as a top enemy in the region. Saudi troops might well find themselves less battle-hardened than the jihadists and would no doubt be singled out for capture. The seizure by ISIS militants of a Jordanian pilot whose plane crashed over Syria in 2014 and his subsequent videotaped killing was a factor in dampening Arab participation in the air campaign in Syria. At a news conference Saturday in Damascus, Syrian Foreign Minister Walid al-Moallem ridiculed the Saudi offer to send troops to Syria, vowing they would "return home in wooden coffins." "The question that Saudi Arabia should be asking itself is: What did it accomplish in Yemen? Was it successful?" he said. "It has sown destruction, hitting every target two, three times and did not leave a stone standing. Did the Yemenis surrender?" Al-Moallem said the offer was a sign of Saudi frustration that their "tools" in Syria were losing in the face of sweeping victories by the Syrian army. The head of Iran's Islamic Revolutionary Guard Corps also said Saturday that Riyadh lacked the courage to make such a move. Tackling ISIS head-on in Syria also risks blowback in Saudi Arabia. The militant group already has carried out multiple suicide bombings in the kingdom, possibly including one late last month at a Shiite mosque in the country's east that has not yet been claimed by any group but bore the hallmarks of ISIS militants. Many of the attackers have been Saudi citizens, pointing to the home-grown jihadist sympathies that Saudi authorities struggle to contain. Fahad Nazer, a political analyst at Virginia-based consultancy and security firm JTG Inc., predicted that a ground campaign against ISIS would nonetheless garner considerable support inside the kingdom, at least initially. But it is hard to say how long that support would last if casualties started mounting, he said. "Very few countries would want to go into Syria without reservations," he said. "I don't think Saudi Arabia would go into this lightly. It would be kind of a last resort."